I’ve never been one to spend a lot of time on homemade pie crust. I happen to think the Pillsbury Refrigerated Pie Crusts are absolutely fine for whatever pie you want to make. And no, Pillsbury does not know me and they didn’t pay me to say that, although I’m open to negotiation. However, I stumbled across this recipe for pie dough on the James Beard Foundation site and decided to give it a try. And guess what? It was easy and it’s better than Pillsbury. 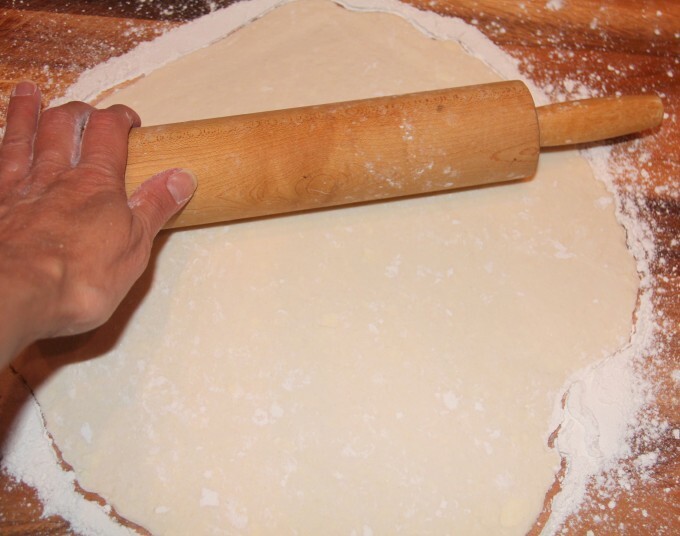 So, next time you want to make a pie, if you have a little extra time try this pie dough. You’ll be glad you did. And if you haven’t perused the James Beard Foundation site, you’re missing out on some fabulous recipes and cooking tips. It’s one of my favorites. This recipe comes from Mitchell Davis, executive vice president of the James Beard Foundation, and he says it was inspired by a recipe and technique created by Julia Child. For the dough, all you need are all-purpose flour and cake flour, salt, butter, shortening (I only use Crisco), and ice water. You’ll need a food processor and plastic wrap. 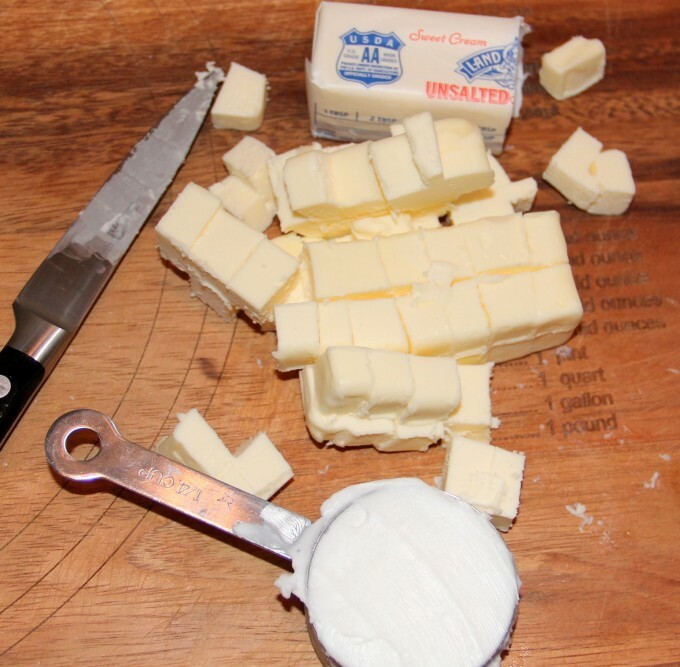 The first thing you need to do is dice the butter and place it back in the refrigerator, along with the Crisco shortening. If you’re making the pie immediately, then put the butter and Crisco in the freezer for a few minutes. Place the flours and salt in the bowl of the food processor and pulse a couple of times to blend. Add the chilled butter and Crisco and pulse five or six times, until the mixture resembles coarse crumbs. Turn the processor on to run continously and pour the ice water all at once through the chute. As soon as the dough forms a ball around the blade, stop the food processor. 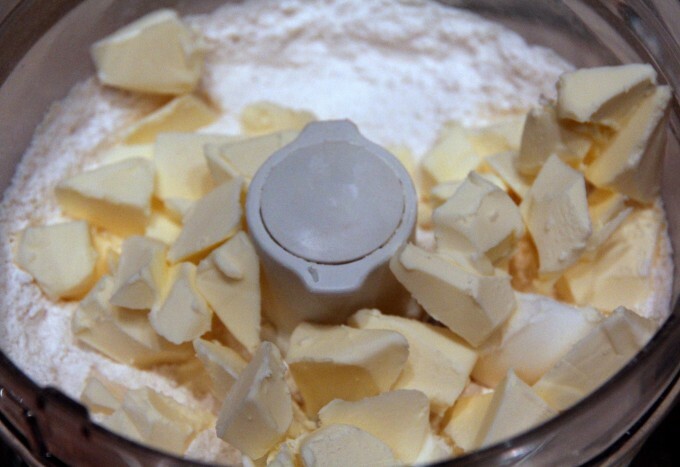 Lay a piece of plastic wrap on the counter and scoop the dough onto the plastic, scraping around the sides of the bowl with a rubber spatula. Divide the dough in half and pat into two balls, wrap tightly and refrigerate for at least an hour. 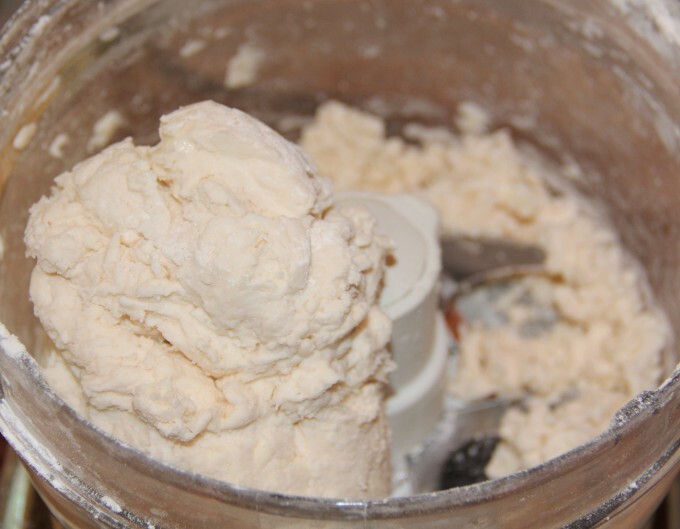 The dough can be refrigerated for two days or frozen for up to two months. If frozen, defrost overnight in the refrigerator before using. 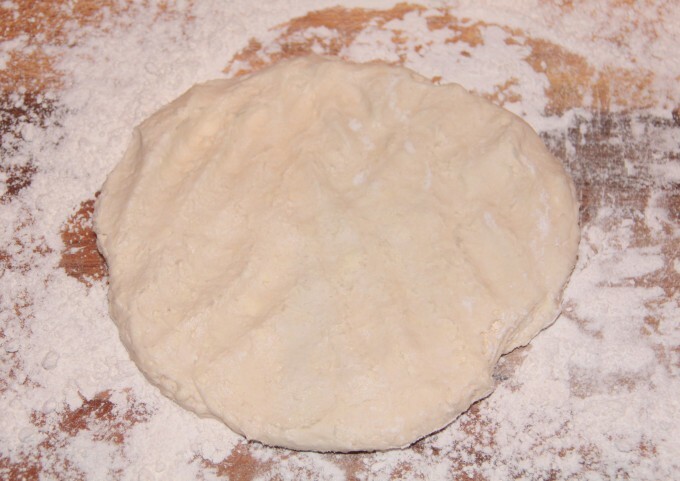 Once you’re ready to make a pie, flour a work surface lightly and place one of the dough balls on the floured surface. Lightly pat to flatten the dough before rolling. Lightly flour the top surface of the dough and roll out with a rolling pin. Roll from the center outward, not back and forth. The dough should be slightly larger than a 9-inch pie dish. Now, here’s the fun part and the part where I always mess up my dough—which is not a ringing endorsement for you to follow my instructions. But, here we go. Gently lift the dough, using two spatulas, both your hands and your husband’s hands (or just your own hands will do if you can’t manage all that, but I think it’s the only way to avoid breaking the dough) and place the pie dough in the dish. 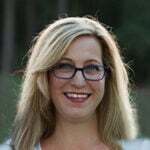 It should overlap the sides a little, which you can trim off or just tuck in around the sides. Then you can crimp it and make it pretty. That’s it. Foolproof, I say! Thank you, Mitchell Davis. An easy, foolproof pie crust recipe created by Mitchell Davis of the James Beard Foundation. 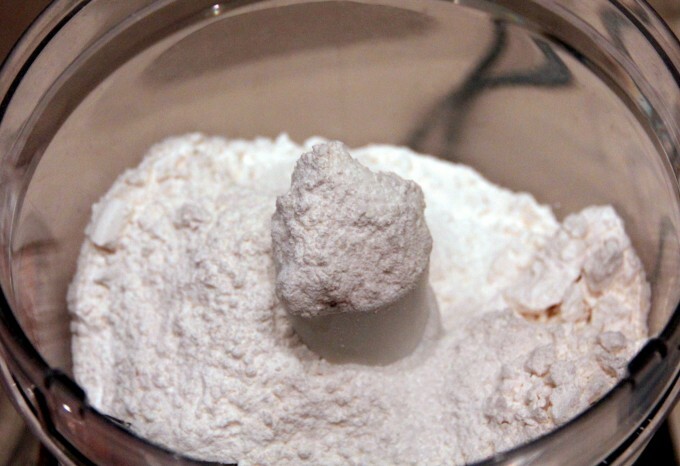 Place flour and salt in food processor and pulse two or three times to blend. 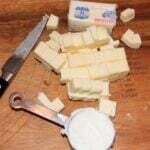 Add cold butter and cold shortening and pulse five or six times to cut the butter into the flour. With the food processor running, pour the water down the food tube. As soon as the dough begins to form a ball, stop the machine. Spread two sheets of plastic wrap on the counter. Turn the dough onto a sheet of plastic wrap, scraping the bowl and blade with a spatula to get every little bit. Separate the dough into halves and place a half on each sheet of plastic wrap. 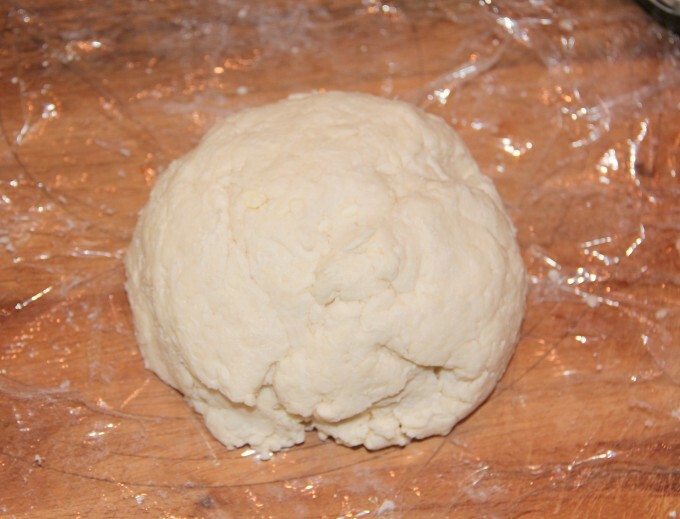 Pat each dough half into a ball, wrap tightly and place in refrigerator for at least an hour before using. Can freeze the dough for several months.